Place of worship for Buddhists of the Far East, usually made up of a series of stories, each with its own roof. Ornament tapering to a point, located at the apex of the uppermost roof. 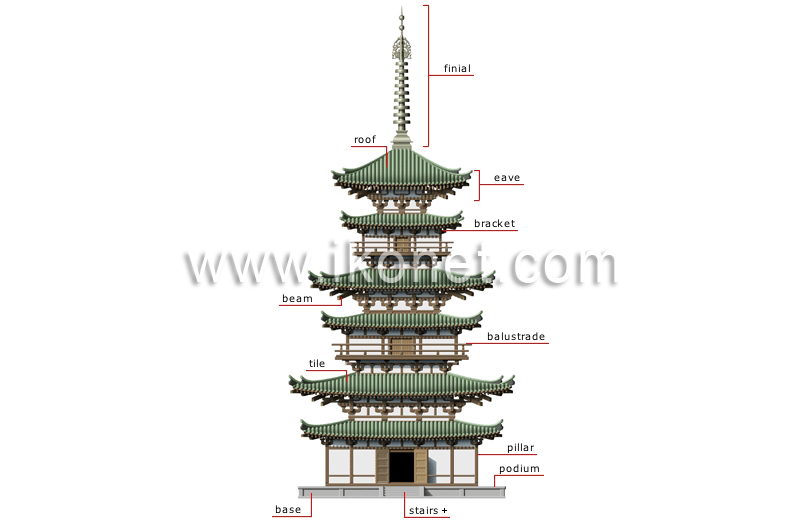 Sloping surface surmounting each of the pagoda’s floors. Roof projection extending from the face of the wall. Support railing along the open edge of the floor. Solid piece of wood used to support a frame. Series of steps leading to the pagoda entrance. Projection used to support a beam. Masonry work on which the pagoda rests. Horizontal piece of wood that supports the weight of the roof.